Wherever we are we like to take our binoculars as bird watching is nice way to get some gentle exercise and if you are lucky see some nice birdies. 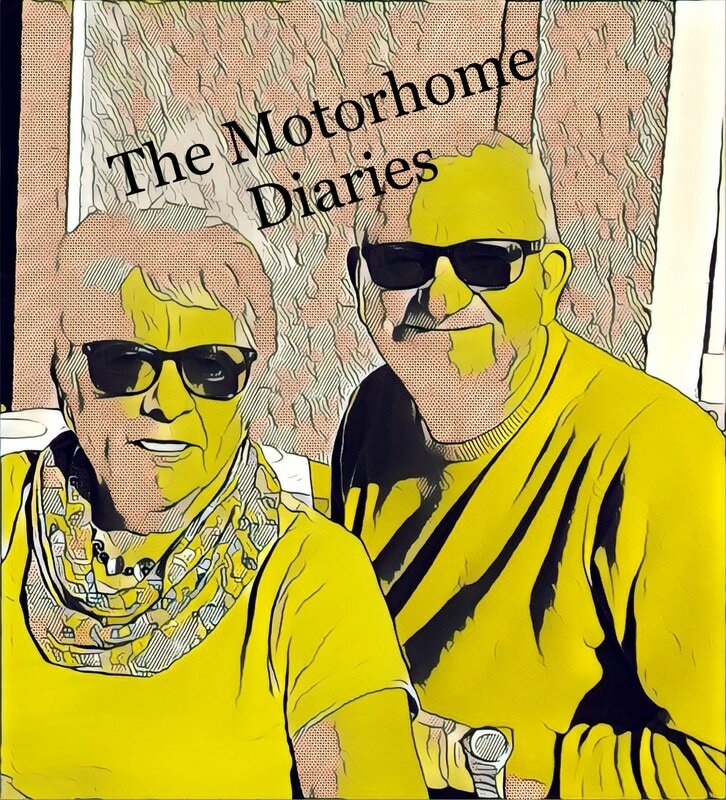 On this page we have avoided listing birds, we are not sure this would be terribly interesting and anyway we are not obsessive twitchers so any list would be incomplete but instead we aim just to describe some nice places for a good walk with binoculars. We are so used to seeing the bar tailed godwit we got quite excited at finally seeing this black tailed godwit in Denmark. These are black winged stilts at Thames in North Island. 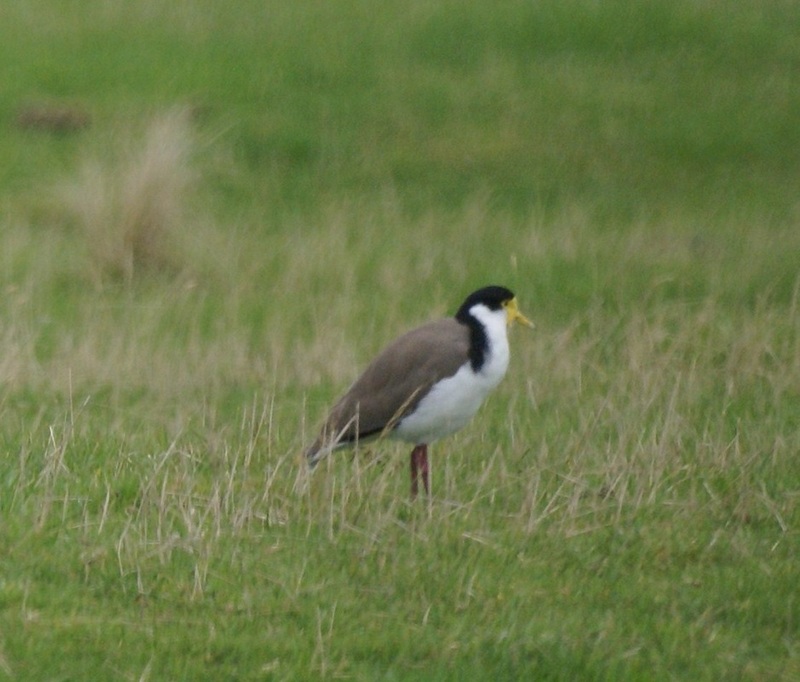 Here you can see the wrybill and the oyster catcher and variable oyster catcher. Oyster catchers, some are variable oyster catchers which are either all black or black and white but with bigger beaks. 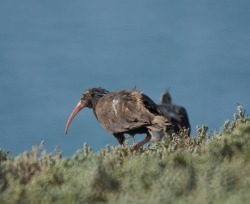 We were fortunate to see bald ibis earlier in 2010 in Morocco. There is only one other place to see them and that is at a breeding station in Turkey and this is one of these. Some may call them ugly, I call them striking. This is the spectacled bulbul, not found in europe at all but we saw this in eastern Turkey. Hoopoe - lots all over europe but this one was in Cappadocia. We saw lots of these Rock nuthatches, often at some of the antiquities in Turkey, noisy little things with very nice mud nests, see below. Noisier and bigger than the european ones. 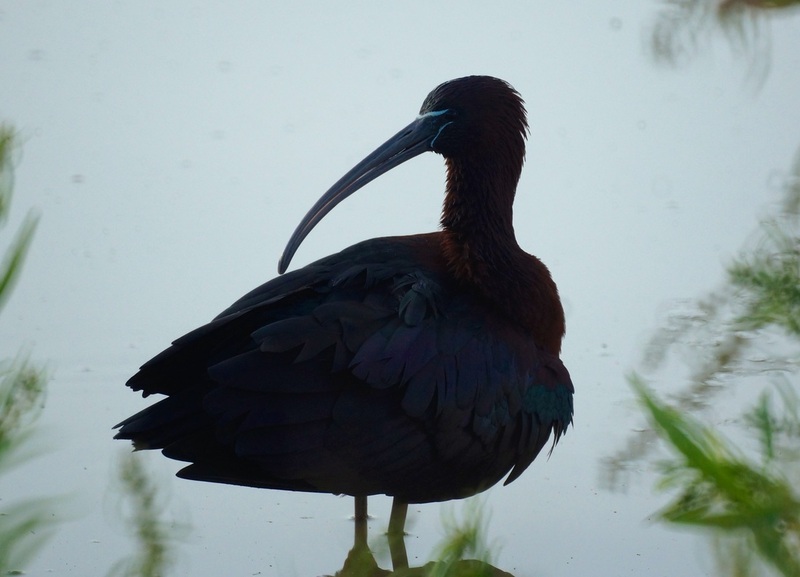 Morocco is the last place where you can find the bald ibis. We were fortunate enough to come across a flock of 28 - probably a sizeable proportion of the total world population. With its extensive salt pans Tavira is an excellent place for birdwatching, from Santa Luzia at one end and the Gran Plaza at the other end there are many days worth of twitching to be had. There is a good range of waders as well as an interesting range of little ones including the common waxbills which we think are very pretty. It is a spot where stone curlews overwinter, we saw around 100 in one field. There were hundreds of goldfinches circling around us at Tavira and eventually a few of them landed in this bush. Did you know that the collective name for goldfinches is a charm? 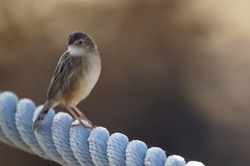 These little birds can smell cameras, it took a good while to get this shot in the Algarve. This ringed plover is not in itself an unusual bird but this was one of the first pictures taken by fixing the camera to the spotting scope. 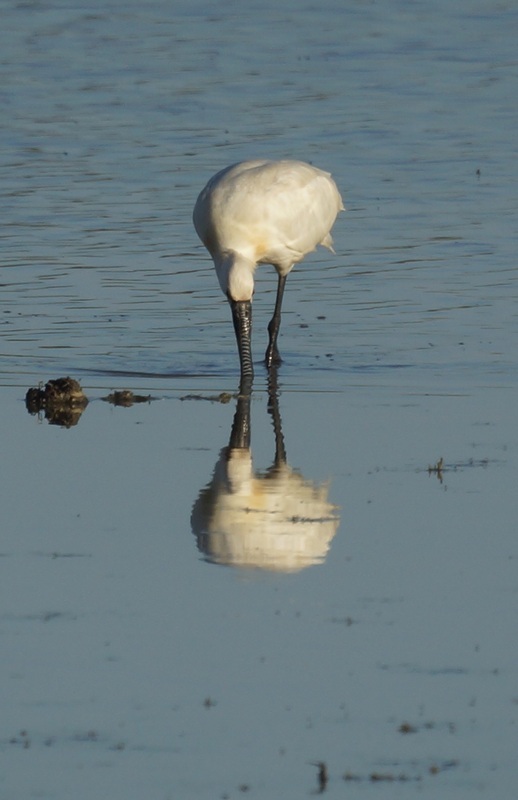 The bird was in one of the tidal pools at Rio Formosa Reserve in Portugal. The Sardinian Warbler, very common in parts of Portugal but we never fail to admire it. We took this photo of a whimbrel at Cacela Velha with our new camera lens. The bird was catching crabs. 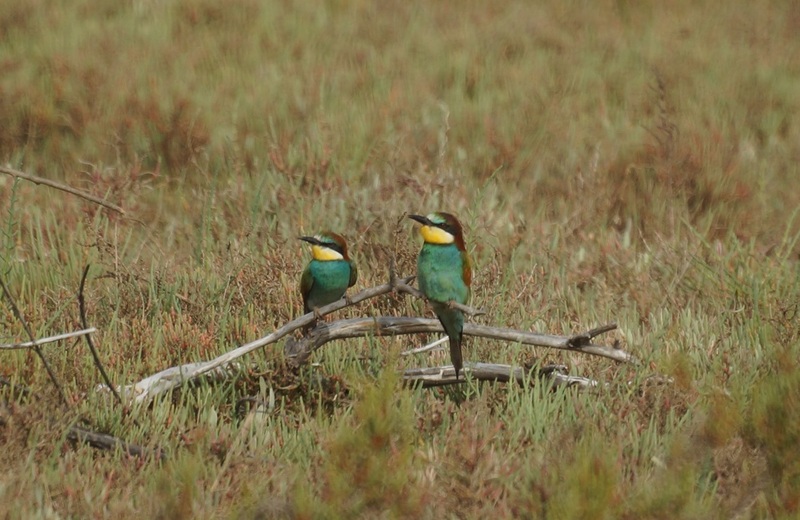 The bee eaters return to the Algarve each April/May. The great thing about stonechats such as this one here is that they sit on the top of branches and wait for you to take a good look at them. Alvor is a delightful little town in the Algarve, not far from Lagos. Clearly very popular with tourists because it is full of restaurants and bars (where we were able to watch European Championship football matches). 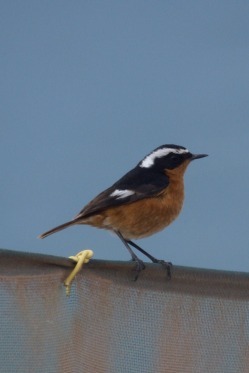 Alvor had been recommended to us as a good birding spot by a man we met in Salgados - and met again in Alvor. There are three main birding areas. 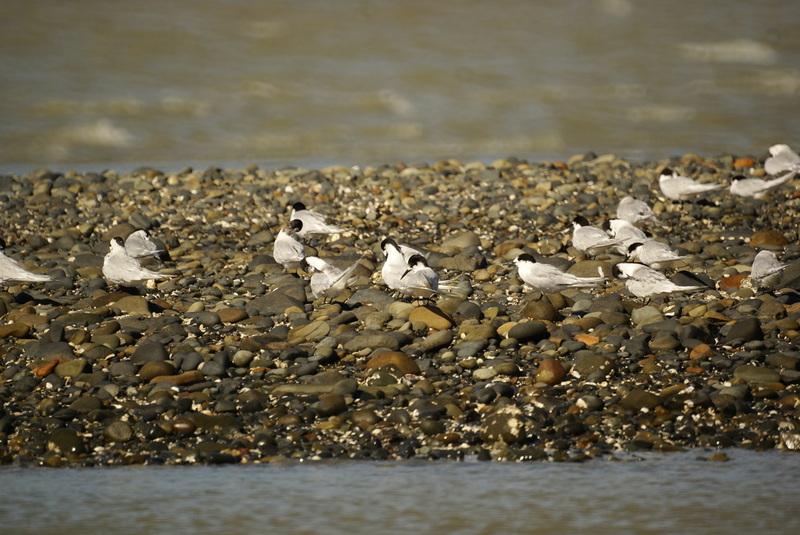 The first is the tidal estuary which is virtually empty at low tide (except for the numerous cockle-pickers), providing good feeding grounds for the numerous waders. We also saw a couple of spectacular displays by Kingfishers here. The second main area is the dunes, where there are plenty of larks, warblers and bluethroats. The third area is upriver near the dam where we saw spoonbills, flamingos and an osprey. You could easily spend three days here and when the weather is good - as it was when we were there - it is an excellent place for both birding and leisure. The campsite is within walking distance of town, a bit basic (we were there in the low season so some facilities were closed) but with all the essentials. However, you do have to learn how to take a three-minute shower. Between Armaceo de Pera and Salgados there is a lagoon that can be a haven for birds. You can reach it from the beach car park at Salgados by taking the raised decking path. Alternatively you can reach it from the beach at Armaceo but you have to watch out for the river breaking through to the sea and barring your way .There seems to be some sort of control of water into the lagoon as we have seen it dry and full without any rain in between and not convinced it is simply a matter of the tide. We have seen lots of water birds, raptors and blue throat here. This lagoon is under threat from development nearby, despite a petition consent to build was given. It took us ages to get this shot in Portugal , but well worth it as they are beautiful little birds. We love these little birds but they can be tricky to photograph. However, on my iPhone I have a birding guide that has the calls of birds listed, I use this as an identification aid and when I used it here in Portugal the little birds came up to see who was singing, perhaps this means that they are very territorial but it did mean we got a shot at last. The Rio Formosa Reserva Natural just outside Olhao is excellent for birding. Entry costs three Euros but you get forest, dune, bush and beach settings and birds are plentiful throughout the year. The storks were a particular delight, and there were also lizards and snakes. 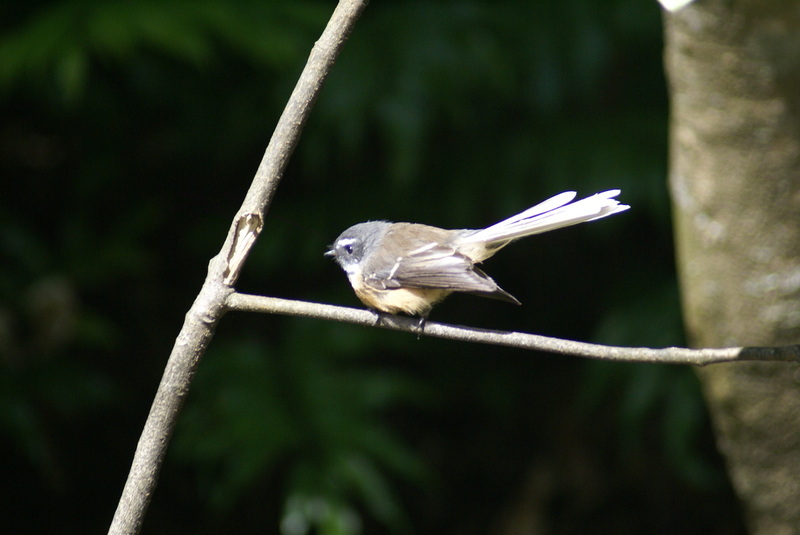 We saw more than sixty different birds in the reserve. 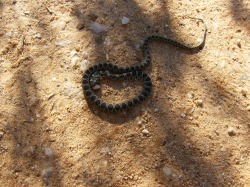 However, the highlight was seen inside the Camping Olhao site. Seeing us with binoculars, some neighbours described a thrush-sized bird with a glossy blue back, a chestnut front, a white collar, a dark head and a yellow eye. 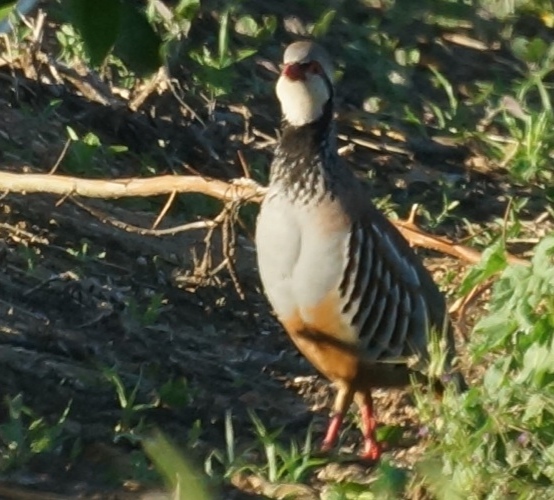 We later saw this bird several times but could not find it in our bird book, or on the internet. It was only when we got back to the UK and looked in our Africa book that we were able to identify the Superb Starling. We stayed at Camping Olhao - another large site, and very popular with over-wintering refugees from all over europe. Excellent facilities, including a bar with football coverage where we saw Liverpool defeat Porto. This went down well with all of the customers but not so well with the staff. The site is within easy walking distance of the reserve. It's taken a long time, a new camera and a powerful lens and a lot of luck, but we have, at last, caught a snipe. We spent a couple of days at Camping L’Aube in Ruimar on the Ebro delta. 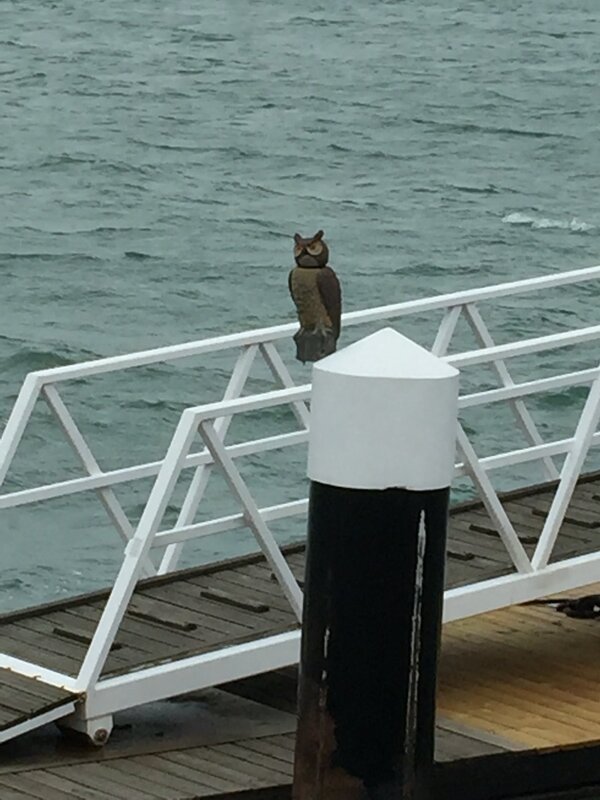 This is an excellent base for bird watching. Some interesting countryside en route – the Ebro delta is a major rice-growing area, criss-crossed with irrigation canals, and there was a lot of harvesting going on – huge combines with tracked drive on the front because they are arse-deep in water. And more Grey Herons and Little Egrets than you could shake a stick at in the harvested fields waiting to catch the frogs in the water. One day went out on our bikes with the scope and at the hides near the campsite we saw cormorants, grey heron, marsh harrier (more here than we have ever seen anywhere), stonechat, coots, reed warbler, little egret, aquatic warbler, kingfisher, sooty tern, swamp hen and redstart. Another day we decided to go further afield towards Poble Nou. We left a lot of gear in the tent at the site and took the van to various spots around the delta and had an excellent day: all the birds of yesterday plus a squacco heron only a few yards away, great crested grebe, wren, pied flycatcher, little grebe, red-crested pochard, bluethroat, whimbrel, great egret, avocet, ringed and little plovers, cattle egret, mallard and common tern. Watching was greatly assisted by several large platforms (one with a roof to protect you from the sun, and seats) which provided excellent views. This delta area is only 26km wide so a manageable area for a bird watching break. 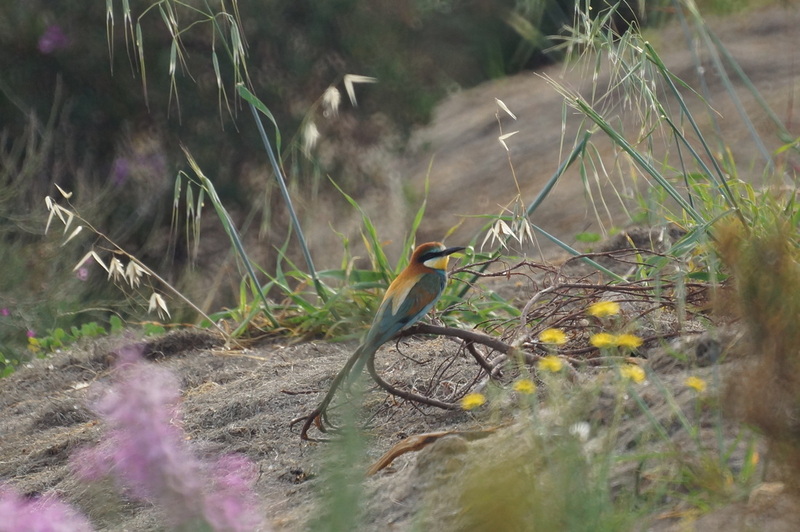 The National Park of Donana is in the Huelva province of Spain and a great birdwatching destination. You can make your own way around the area, or you can get a place on a bus for a guided tour or you can do what we have done which is to take your own guided tour with a personal guide. 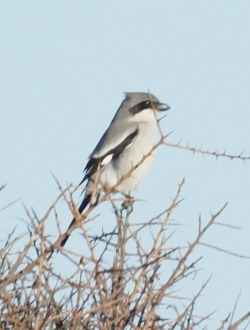 We recommend DonanaBirdTours.com as we had a marvellous day bird watching in October 2008. We were able to see a wide range of raptors including red kites (pictured) and black shouldered kites, on our one day we saw about 50 different species. 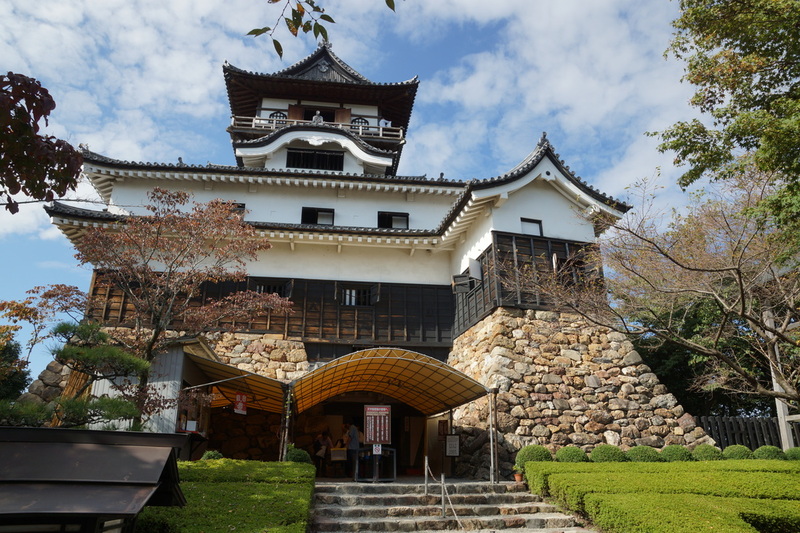 There are some charming little towns in the area which merit a visit too. El Rocio and Almonte to name but two of them. If you get to El Rocio visit the over decorated church and the Madonna there which attracts tens of thousands of worshippers in the spring of each year, also have fun driving across the unmade roads that make you think you are walking through the set for a spaghetti western.